As the year draws to a close, many of us are traveling to see family and friends – across town, across the country, or perhaps even across the globe. No matter where you are going or how you choose to get there, I urge you to do everything you can – such as buckling up whenever there are seat belts (yes, on airplanes, taxis, and buses, too!) – to make sure you and your loved ones are as safe as possible wherever you are going for the holidays. Although some people will take planes, trains, ferries and boats, the majority of us will be on the roads for at least part of our trip – whether it’s using a car, motorcycle, bicycle, bus, or even our own two feet. It is clear that road safety affects us all, no matter where we are driving, riding or walking. Figure 1. Dinh-Zarr (second from right) with delegates from Spain and the UK. I was reminded of that last month when I participated in the Second High Level Meeting on Global Road Safety in Brasilia, Brazil, as a member of the U.S. delegation, which also included my federal colleagues from the National Highway Traffic Safety Administration, the U.S. Centers for Disease Control and Prevention, and the Office of Global Health of the U.S. Department of Health and Human Services. This meeting brought together 2,000 key leaders and advocates in public health and transportation safety from around the world to take action in preventing the more than 1.2 million deaths (and tens of millions of injuries) that take place on the world’s roads every year – with more than 30,000 deaths occurring in our own country alone. The result of the meeting was the Brasilia Declaration, which reaffirmed the goals of the UN Decade of Action for Road Safety and called on governments to address key risk factors related to road safety – ranging from preventing impaired driving and improving infrastructure to manufacturing safer vehicles and increasing emergency health services. Figure 2. Dinh-Zarr with members of Safe Kids Worldwide. While the specific topics are many, two themes seem to run through this Declaration: (1) road traffic safety is a public health issue, so the transportation and health sectors can and must work together to reduce deaths and injuries; and (2) it is our responsibility to protect the most vulnerable people – children, the elderly, pedestrians, cyclists, people with less means – so that everyone can have equal access to safe transportation. In addition to the Declaration, there were official side events related to this High Level Meeting. 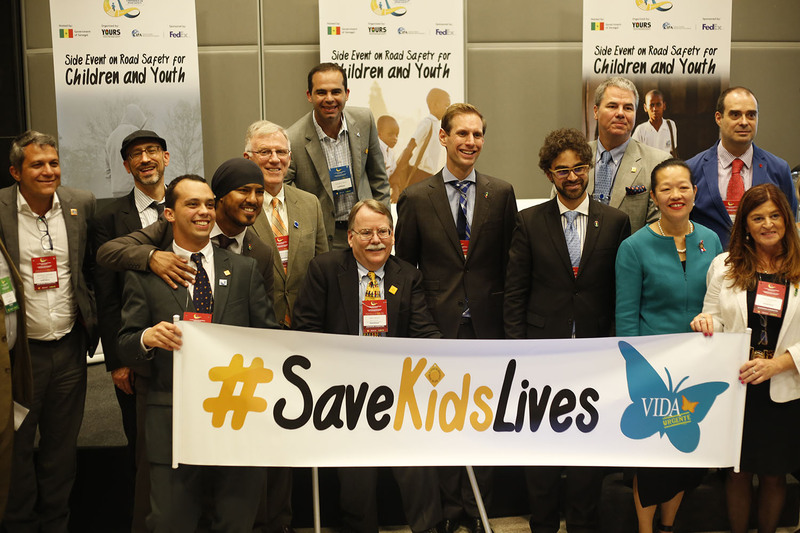 I was privileged to speak in the Target & Indicators session, which was introduced by World Health Organization Director-General Dr. Margaret Chan, and in the Children & Youth session, which was organized by YOURS/Youth for Road Safety and the Child Injury Prevention Alliance/CIPA. Figure 3. Dinh-Zarr with U.S. Ambassador to Brazil Ayalde. 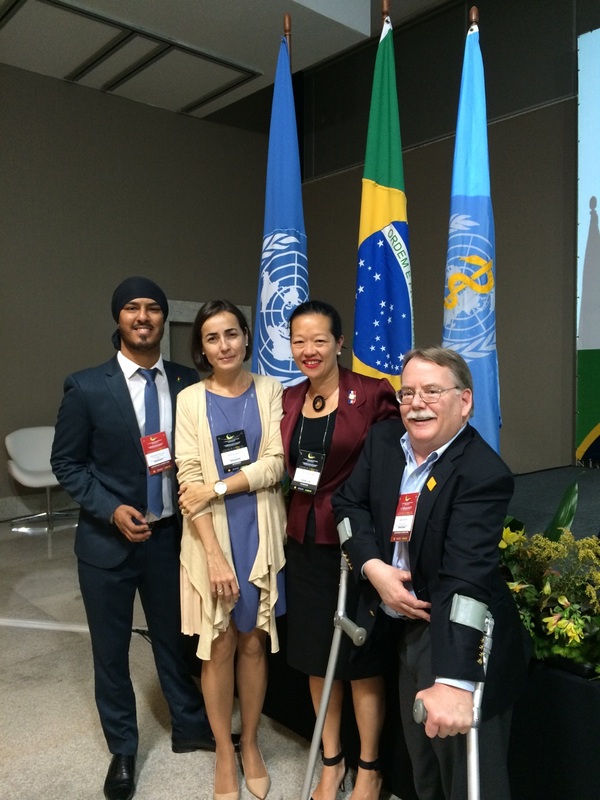 Following this historic meeting, while still in Brasilia, I had the pleasure of meeting the U.S. 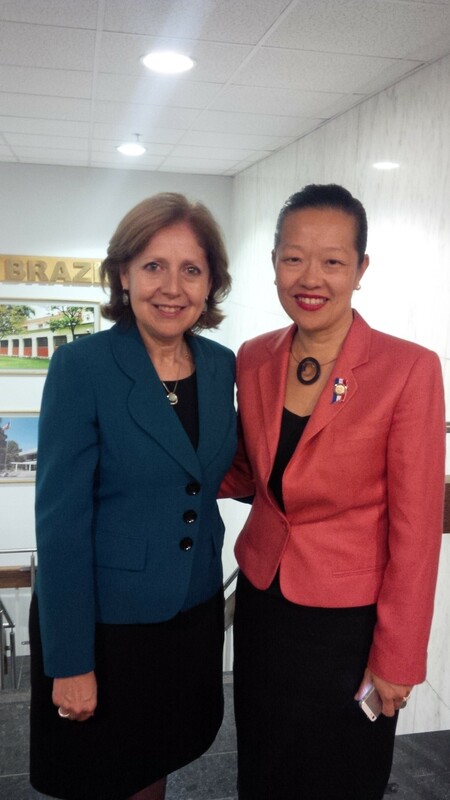 Ambassador to Brazil, the Honorable Liliana Ayalde. I am truly grateful to the ambassador and her staff at the U.S. embassy in Brazil for their work to help us attend this important lifesaving conference and for their service to our country throughout the year. Ambassador Ayalde and I share a common background in public health, and I know that public health – and the interdisciplinary collaboration among health, transportation, and other sectors – will be vital to setting and achieving our goal to save millions of lives on the roads in the coming years. As I said in my remarks in Brazil, there is no doubt that our targets for road safety must be feasible, they must be measurable, and they must be based on sound science. But they also can – and should be – ambitious. Targets allow us to imagine what the world would be if our efforts and work were as effective as they could be. Targets allow us to imagine a world where no one dies because they were not properly restrained, where we know our cars and roads will protect us if we make a mistake, where no one thinks about getting behind the wheel when impaired by alcohol or drugs, and where we can send our loved ones to school or work and know they will come home safely. Targets allow us to imagine a better, safer, and healthier world for everyone. No matter where you are traveling as the year draws to a close, even if it is simply across town, I wish you a safe journey and a safe and healthy 2016. And, remember, there are people around the world, including right here at the NTSB, who are working hard every day to make sure we all get home safely. Following a catastrophic commercial truck or motorcoach crash, there is often a temptation to immediately allocate blame by highlighting a driver’s inappropriate actions or by finding fault with a motor carrier’s safety programs. Yet, true safety leadership acknowledges that accidents, tragic as they are, should not be viewed as exercises in placing blame but as opportunities to learn and seek ways to improve safety and prevent future accidents. Recently, I saw a perfect demonstration of this type of safety leadership from the US Department of Transportation (DOT)’s Federal Motor Carrier Safety Administration (FMCSA). Two years ago, in November 2013, the NTSB completed its investigation of four commercial motor vehicle crashes that resulted in 25 deaths and 83 injuries. Through our investigations, we identified shortfalls in the FMCSA’s compliance review processes and subsequently issued two recommendations to the DOT calling for an audit of the FMCSA’s oversight programs. In response, the DOT convened an expert Independent Review Team (IRT) to evaluate FMCSA programs and provide recommendations for policy and procedure improvements. The evaluation and actions taken by DOT far exceeded our expectations and culminated in a ground-breaking report, titled Blueprint for Safety Leadership: Aligning Enforcement and Risk. Not only did the IRT report provide actionable information in response to our recommendations, but it also provided insights and perspectives on other ways the FMCSA can improve motor carrier safety. Equally as impressive as the quality and thoroughness of the IRT review has been the FMCSA’s enthusiasm to implement positive change. Even while the review was underway, the FMCSA proactively made program changes based on the feedback it was receiving from the IRT. The FMCSA has already fulfilled several IRT recommendations, including enhancing training for its investigators and improving the use of data to better assess motor carrier risk factors. Moreover, the FMCSA has formed a Continuous Improvement Working Group, which will assist in improving the Compliance, Safety, Accountability program and in implementing the IRT recommendations. The FMCSA is to be commended for its responsiveness and willingness to learn from tragedy to avoid future tragic accidents. Having seen firsthand the dedication and professionalism of the men and women of the FMCSA, I am confident that the agency will continue to strengthen commercial motor vehicle safety and reduce crashes, injuries, and deaths on our nation’s highways. Every community is different, but some things are the same. Everybody wants – and rightly expects – to return home safely from work, school, or play. 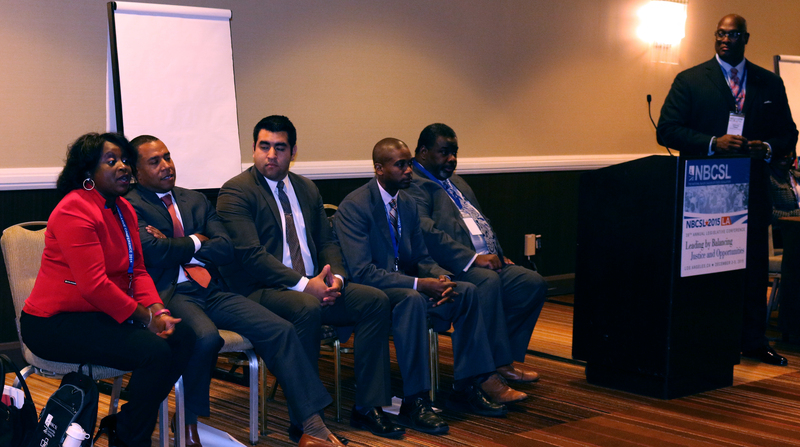 I recently attended the conferences of the National Hispanic Caucus of State Legislators (NHCSL) and the National Black Caucus of State Legislators (NBCSL) to learn about these legislators’ concerns and to explain the NTSB’s transportation safety recommendations. Much of the work that we do begins with legislators, and to accomplish our goals and objectives we must go where they are. In my recent blog, Developing Future Safety Advocates: Reaching the Millennials, I discussed educating youth about highway safety. At the NHCSL and NBCSL, I learned about the viewpoints of legislators from two distinct communities, and I had the opportunity to explain how proposed safety measures could benefit their respective communities. To reach minority communities with safety messages means getting a seat at an already crowded table. The NTSB’s message regarding better education, legislation, and enforcement related to transportation safety, for example, might be lost among news stories emphasizing more contentious issues. In many cases, these state legislators are pivotal figures in implementing safety recommendations, and many of them are champions of transportation safety in their own communities. The NHCSL held its annual conference in November, with a focus on improving legislative involvement by and for their constituents in the Hispanic community – the largest and fastest-growing minority in the country, and one that faces particular transportation challenges. The Centers for Disease Control and Prevention reports that pedestrian death rates are higher for Hispanic males than for all males (3.93 per 100,000, vs. 2.29 for all males). Rates are higher for Hispanic females as well – 1.29 compared with .92 for all females. Such disparities are not unique to Hispanics; in fact, Native Americans are confronted with even higher pedestrian death statistics. However, factors contributing to these disparities change from community to community. Among Hispanics, the National Highway Traffic Safety Administration (NHTSA) points to possible contributing factors affecting newer arrivals. Initially, many walk or ride a bicycle, which puts them at higher risk of a pedestrian or bicyclist motor vehicle injury. Additionally, new arrivals must learn uniquely American rules of the road and driving customs and the meaning of U.S. traffic signs and rules. Language barriers might also affect their level of safety. So for this group, pedestrian and bicyclist safety is of vital importance. Some of the many discussions at the conference included youth development and education, and community safety issues. In a 2006 analysis of fatal crashes, the National Highway Traffic Safety Administration found that while Whites, African-Americans, and Hispanics all had about the same chance of dying in a motor-vehicle crash, African-Americans were particularly likely to die in a crash involving a bus. African-Americans killed in passenger-vehicle crashes were also more prone to be unrestrained. While this study is older, year after year, the National Occupant Protection Use Survey continues to record that, while seat-belt use by African-Americans is growing, it is still below the national average – and we know that seat belts save lives. In my view, getting my fellow African-Americans to recognize the importance of using seat belts and child restraints on every trip is a community issue – as is the installation of restraints on school buses, motorcoaches, and medium-sized buses. The early estimates for 2015 point to a dramatic increase in the number of highway deaths nationwide. Better economic conditions are often cited as fueling more travel, and in turn, more tragedies. Traveling more increases the chances of a crash. But eliminating impairment, distraction, and fatigue – and improving occupant protection – can turn around the statistics for all of us. Many states still require stronger legislative action on issues such as these. I also had the opportunity to talk with legislators about other transportation issues, such as rail tank car safety, commercial trucking, and mass transit safety that affect their communities, as well. For me, attending these conferences was about learning from the legislators and, hopefully, they learned a bit from me about how to improve transportation safety. The NBCSL conference closed with the question, “are you fit for your job?” It was meant to encourage each of us to look at our medical, mental, and psychological fitness for duty. It gave me an opportunity to also talk about the NTSB campaigns for medical fitness for duty and against impaired driving. The NTSB’s recommendations have no color and no ethnicity, but they resonate differently for different communities. It was a privilege to join the conferences of our two largest minority state legislators and to review their special transportation safety challenges. While the mosaic that makes up this great nation is complex, safety has no complexion. Nicholas Worrell is Chief of the Safety Advocacy Division in the NTSB Office of Safety Recommendations and Communications. Many of you know by now that the number-one killer of youth ages 15–19 is highway crashes. Ninety-four percent of deaths in transportation happen on our roads. A disproportionate number of those deaths involve young and novice drivers – our children. Today, highway deaths are on the rise; clearly, there is much work to be done. So the question is, what more can be done to save the next teen driver? Step by step, child by child, school by school—we must work our way into the hearts and minds of the youngest and most vulnerable to change the culture of safety on the nation’s roadways. NTSB has issued several recommendations regarding teen driver safety, and we put the issue on our Most Wanted List of transportation safety improvements. But those actions alone aren’t enough. Together, with other advocacy groups and government entities, we must get out and educate and create youth safety ambassadors to carry the message of safety to their community and peers. Youth today are inundated with messages. When I talk to teens, they’ve grown up with messages, such as “Don’t Drink and Drive” and “Buckle Up.” Some messages are newer: driving and sending Facebook messages is not safe; talking on the phone while driving is not safe; texting at the red light is not safe; driving on too little sleep is not safe; driving with passengers in their car is not safe. As youth hear passionate NTSB representatives talk about the safety lessons learned from our accident investigations and how such accidents lead to tragic deaths for those who come face-to-face with the real consequences of poor decision making behind the wheel, we hope the ad campaigns that they have seen will take on a more real human dimension. When I am fortunate enough to be that representative, I get the thrill of seeing the light bulb go on for some. And when young people approach me after a talk about how they can spread the word to other teens, I know that we have succeeded. We are reaching the teens who can translate to their peers the lessons that the NTSB has learned. This week, I had the opportunity to help create young advocates and ambassadors for safety. 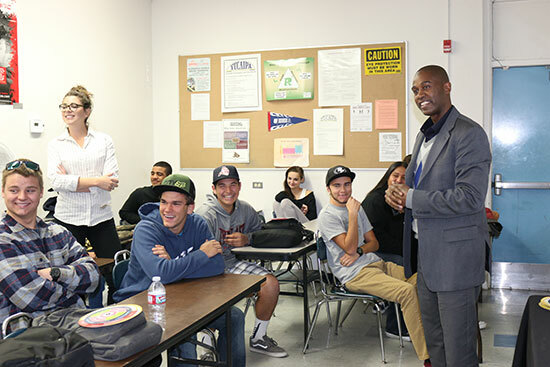 It began with my first visit to an assembly of students at The Masters College in Newhall, California. Many young people in the audience had never heard of the NTSB and seemed puzzled at first as to why teen driver safety is so important to us – but they now know. When I asked who had ridden with someone who was driving distracted, almost every student’s hand went up. When I pointed out that those drivers were putting their lives at risk, in addition to their own, I saw the light bulb go on for many. My next visit was at Yucaipa High School in Yucaipa, California, where I partnered with Impact Teen Drivers Educational Coordinator Zoe Schuler, a champion for safety who makes it her business to reach youth and adults with lifesaving messages and strategies. During my visit, students learned about the various elements of distracted driving: cognitive, manual, visual, and auditory distractions. They watched videos and heard stories of victims who were hit by distracted drivers or who have hit someone else. More importantly, they learned how to adapt to the game plan for safety. They learned how common habits can become deadly habits. They listened attentively, and when asked for takeaways, each of them recapped what they had learned – and explained how they would adapt their own habits to make their lives safer. This collaborative effort with Impact Teen Drivers, like other collaborative efforts with advocacy groups, was enormously fulfilling. Working alongside the group’s educational coordinator reminded me that I was continuously learning, as well. 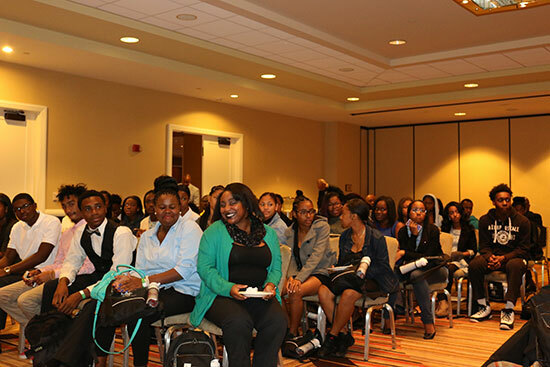 Presenting to Los Angeles public school students at National Black Caucus event. My final presentation was to more than 200 students from Los Angeles high schools. This was just one of several presentations delivered to teens as part of the National Black Caucus of State Legislators Annual Conference. Each year, the Caucus’ first order of business is always to meet with students in the state in which they are convening to help educate and empower youth. During their visit to this conference, students learned life skills, how to be a success, and about the legislative process. I had the opportunity to speak about why the work we do at NTSB is so important. I reminded teens about why we need them to speak up and speak out for transportation safety. One of the students attending said she was, “always telling her parents not to text and drive, but they still do it.” Yet she remains an advocate, even if it means speaking up to her parents. I loved that approach, and took the opportunity to tell her peers that they had my personal permission to speak up if they saw parents or other adults modeling bad driving habits. After all, adults must model good driving habits for youth, because while kids learn from what we tell them, they learn more from what they see us do. This is one week of NTSB outreach at a glance, a week of educating those who will drive in the lane next to us tomorrow – and soon after that, will be helping to make decisions on highway safety legislation. Millennials are the most connected generation ever, and we must go where they are to communicate the safety message. But while millennials are social media “natives,” they still crave face-to-face contact. They are different from the generation I grew up in: they believe that they are entitled to speak up and be taken seriously, and are hungry for the knowledge that gives them something to speak up about. Reaching new drivers, one youth at a time, one step at a time, can save young lives. But the real benefits begin when they reach each other – and the adults in their lives – after the NTSB has gone. Nicholas Worrell is the Chief of the Office of Safety Advocacy in the NTSB Office of Communications. Today, the NTSB hosted members of the Commercial Aviation Safety Team (CAST), a group of key government and commercial aviation stakeholders working toward improving commercial aviation safety. CAST meets bimonthly and is focused on finding ways to reduce the commercial aviation fatality risk in the United States by at least 50 percent from 2010 to 2025. At this meeting—hosted in the NTSB Board Room—I was proud to introduce an NTSB produced video to highlight a safety problem we see emerging from our accident investigations: failures of procedural compliance. “Procedural Compliance” is on the NTSB’s Most Wanted List of critical transportation safety improvements. During investigations, we too often find that pilots have deviated from or failed to follow procedures related to flying stabilized approaches. Crashes have occurred because pilots did not maintain a sterile cockpit, monitor critical flight parameters, including airspeed, or heed aircraft limitations. Our investigators have discovered missed or incomplete pre-flight briefings and checklists, and callouts. Our video highlights findings from seven crashes, including the Asiana flight 214 crash in San Francisco, California, in 2013, and the UPS crash in Birmingham, Alabama, also in 2013—as well as some lesser known crashes. Everyone plays a role in ensuring procedural compliance—the airline operator, the regulator, and the pilots. They must work together to develop clear, concise and reasonable procedures; make sure train to the procedures; and make sure procedures are followed. By achieving consistent and strong procedural compliance, we can continue our success in making commercial aviation one of the safest forms of transportation. Dr. Weener is a Member of the NTSB Board.